It’s the 2010 Campaign, Again. Even though the 2010 campaign did not heat up until the primaries began in earnest in the spring, it is now the third-biggest story of the year to date, accounting for 7% of the newshole, according to PEJ’s News Coverage Index. The No. 1 story in 2010 thus far has been the economy (12%), followed by the Gulf of Mexico oil spill (9%). On the ideological radio and cable talk shows last week, a full 69% of the airtime studied was devoted the elections—with hosts finding plenty to talk about as President Obama launched a series of campaign-style appearances around the country. Changes in the Obama Administration—led by the departure of controversial chief of staff Rahm Emanuel to run for mayor of Chicago—represented the fourth most-covered topic, at 5% of the newshole. Several storylines converged to keep the November elections high on the news agenda last week, from the president’s public appearances to rally supporters to the twists and turns in a number of key races. 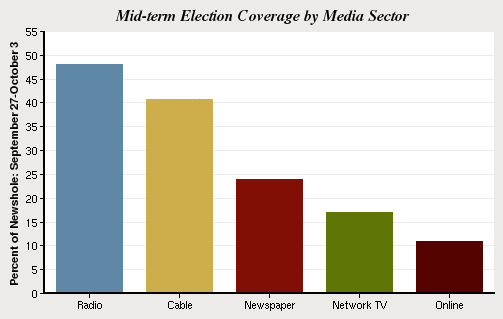 At 26% of the newshole, the midterm elections led in all five media sectors and consumed nearly half the airtime studied on radio (48%) and more than a third (41%) of it on cable TV. 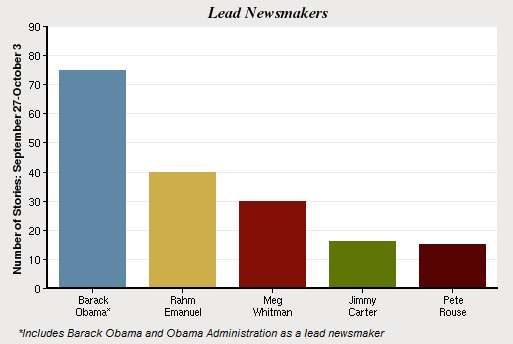 Though he is not on any ballot, Obama was the lead newsmaker in 20% of the campaign stories last week (to be a lead newsmaker, someone must be featured in at least 50% of a story), indicating the degree to which his return to the campaign trail drove the coverage. For example, NBC’s Savannah Guthrie, appearing on MSNBC on Sept. 29, noted that the crowd that turned out for the president’s appearance at the University of Wisconsin at Madison was large and reminiscent of those from his 2008 run for the White House. “The White House hopes everyone looks at that rally like we saw at the University of Wisconsin and asks ‘What enthusiasm gap?’ He was able to pack thousands of students into the area. The only question is will he be able to pack them into the polls?” Guthrie said. Though by the end of the week there were reports of the tightening of some polls, the dominant theme was the losses that Democrats are expected to suffer and how some seats once considered safe for Democratic incumbents were suddenly in play. A steady drumbeat of coverage of Delaware GOP senate nominee Christine O’Donnell kept her in the headlines—but not necessarily in a way that a candidate would prefer. Liberal talk show hosts aired archival clips of her where she rejected evolutionary science—In part, she said, because monkeys do not seem to be evolving today—and took other controversial stances. This contributed to a narrative about some of the tea party candidates holding unconventional views. News in other prominent races also generated headlines, such as revelations that California Republican gubernatorial candidate and former business executive Meg Whitman once employed an illegal immigrant as a housekeeper (Whitman denied knowing the woman was not legal). Whitman, who also faced off last week in a debate with Democratic opponent Jerry Brown, was the lead newsmaker in 15% of the election stories in the sample, second only to Obama. Carl Paladino, the GOP candidate for governor of New York, also made news when he appeared to threaten a New York Post reporter during a heated exchange. Though it garnered only about a third as much coverage as the elections last week, the economy (9%) remains the biggest story of 2010 and a continuing source of mixed headlines. Last week came news of a rise in home values, a decline in consumer confidence and accusations that bankers took shortcuts in processing foreclosures. As it has often in the past, economic news received the most coverage in newspapers last week, where the subject accounted for 16% of front-page newshole. That compared with 10% of the newshole online and 6% and 4% of the airtime on network and cable news, respectively. Allegations that some home lenders had not properly processed the paperwork for thousands of foreclosures prompted three of the biggest lenders to put a hold on foreclosures altogether. That helped push housing to the top of the economic news agenda, accounting for almost one-fifth of the overall economy coverage last week. “Tens of thousands of Americans who were on the verge of losing their homes are getting an unexpected reprieve,” said Lester Holt on the CBS Evening News on Oct. 1. Further debate over the expiring Bush-era tax cuts, and a census report that showed a historically wide income gap between the poorest and richest Americans, were also prominent in the coverage. The decision of Obama chief of staff, Rahm Emanuel, to leave the White House and word of the appointment of his successor, Pete Rouse, dominated stories about the administration, which represented the No. 4 story last week (5% of the newshole). News of the administration was the second- biggest story on radio news (7%) and the third- biggest story on network TV (7%) and cable news (6%). The shooting of some Pakistani soldiers by American forces in a helicopter attack, and the subsequent closing of a NATO supply route through that country, made Pakistan to the No. 5 story last week, at 4% of the newshole. Some of that coverage was also related to flooding that hit the nation several weeks ago, but is still causing misery. Close behind (also 4%), was the war in neighboring Afghanistan. Among the stories driving that narrative were allegations of U.S. soldiers killing civilians. Videotapes of interrogations of U.S. service members admitting a role in the killings were leaked, and that storyline was the biggest last week, representing more than one-third of the overall coverage of the war. All five of the top newsmakers last week were political figures, further evidence of the growth in coverage of the 2010 elections. President Obama was No. 1, having led in 8% of the stories (to be a lead newsmaker, someone must be featured in at least 50% of a story). His departing chief of staff, Rahm Emanuel, was second, at 4%. The man announced as his successor, Pete Rouse, was the fifth leading newsmaker, registering in 2% of the stories. California gubernatorial candidate Meg Whitman, who appeared in a debate with Democratic rival Jerry Brown and addressed revelations that she once employed an undocumented worker as a housekeeper, was No. 3, at 3%. And former President Jimmy Carter was No. 4, at 2%. Carter was briefly hospitalized after he fell ill while on a book tour in Ohio.